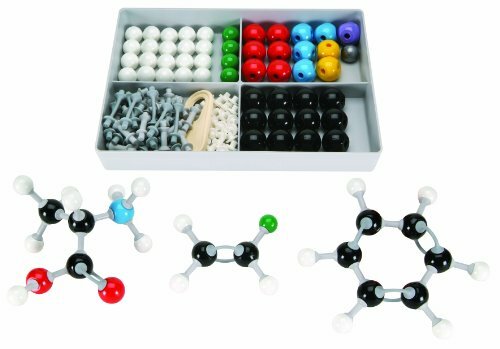 Each Organic Chemistry Student Set comes with an instruction leaflet and is packed in a four-compartment box. Sufficient links are provided to make single, double, and triple bonds for OPEN and short links for CLOSED models. The models can easily be assembled and reassembled to make hundreds of possible structures. Organic chemistry student set includes 50 atom parts: 12 black 4-hole tetrahedral carbon, 6 2-hole angular oxygen, 20 1-hole white hydrogen, 4 blue 4-hole tetrahedral nitrogen, 1 yellow 4-hole tetrahedral sulphur, 1 yellow 6-hole octagonal sulphur, 1 purple 4-hole phosphorus, 4 green 1-hole halogen, and 1 gray 1-hole metal. Also included are 26 medium gray links, 12 gray flexible long links, and 26 white short links with 1 link remover tool.